Mysore District is an administrative district located in the southern part of the state of Karnataka, India. On the 22nd (Mon), contemplate in the serene atmosphere at Sri Chamundeshwari Temple. 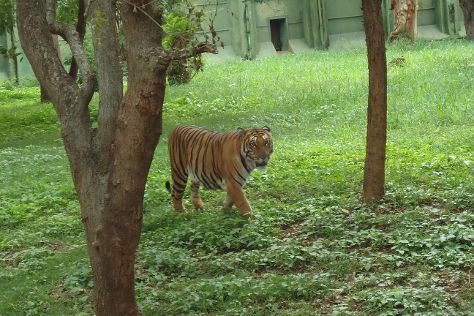 Here are some ideas for day two: step into the grandiose world of Mysore Palace (Amba Vilas), pause for some photo ops at Statue of Maharaja Chamarajendar Wodeyar, then grab your bike and head to Outback Adventures, and finally admire nature's wide array of creatures at Planet Earth Aquarium. To find photos, traveler tips, reviews, and other tourist information, use the Mysore District trip itinerary site . Mumbai to Mysore District is an approximately 6.5-hour combination of flight and taxi. You can also drive; or do a combination of bus and taxi. When traveling from Mumbai in April, plan for little chillier days and about the same nights in Mysore District: temperatures range from 36°C by day to 26°C at night. Wrap up your sightseeing on the 24th (Wed) early enough to drive to Ooty (Udhagamandalam). Start off your visit on the 25th (Thu): admire the natural beauty at Rose Garden, take in nature's colorful creations at Botanical Gardens, and then take in the awesome beauty at Doddabetta Peak. Keep things going the next day: take in the dramatic scenery at Pykara Lake and Pykara Falls, explore the activities along Pykara Lake, and then contemplate the waterfront views at Ooty Lake. For reviews, more things to do, other places to visit, and other tourist information, go to the Ooty (Udhagamandalam) travel route planner. You can drive from Mysore District to Ooty (Udhagamandalam) in 2 hours. Other options are to do a combination of taxi and bus; or do a combination of taxi and bus. In April, plan for daily highs up to 36°C, and evening lows to 26°C. Finish up your sightseeing early on the 26th (Fri) so you can travel back home.